Soothing or distracting? It seems nobody knows. I love sounds in the car when I'm driving. I've spent many an hour recently ripping the CD collection to a USB stick so I can play them in the car. No CD payers in new cars which is not a great step forward in my opinion. All this has led me to read up a bit on the effect music has upon driving. Different studies have provided different answers to the question of distraction. Apparently classical music is the most distracting and I can see why. It's complex stuff which demands a certain amount of concentration from the listener. If the concentration effort is going on the music then it can't be going on the road. Classical can be just the thing in a traffic jam though. It can sooth the soul that would otherwise be getting frustrated about not getting anywhere. The tempo of the music is a factor. The faster the BPM the faster you want to drive which makes sense. A friend commented on this many years ago when my driving suddenly became more aggressive whilst listening to Korn. Nowadays I can listen to the most intense thrash and keep to a reasonable speed. Music on the motorway is absolutely essential. A few hours of driving in a straight line can be deadly boring without something to keep the mind occupied. In an urban traffic situation music can become annoying so I just turn it off. It would be interesting to do an experiment on a driving lesson. Three tracks played on the move. One slow, one medium and one fast paced track could be played and the pupil's driving monitored to see if there is any effect. This would be a good chance to get those coaching skills to work and get some feedback from the pupil. It would make them consider driving in a wider context and benefit them after passing the driving test. As well as discussing how it made the pupil feel it would also bring to light how many other sounds were masked by the music. Noise from other cars, siren from the ambulance etc. It feels a lot more like driving in isolation when there are sounds on the stereo. To be honest the biggest distraction is when actually selecting the tunes. The new touch screen interfaces take so much scrolling up and down and poking of buttons to get what you want. It's surprising how long I'm not paying attention to the road when I'm doing this. At least I'm aware of this and wait for an opportune moment to make my selection. The touch screen on my car decides not to work on some mornings and then the thing goes mad and scrolls through menus of it's own accord. I rang the garage and they say this isn't normal. 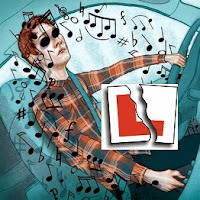 No driving instructor can take a day off to sort out the sounds so I'll have to see if this is a temporary glitch. Happy motoring and choose your music wisely!